Coffee Favors Fresh Roasted by the Old Chicago Coffee Co. This American roast coffee is made fresh in the USA from coffee beans that feature 80 percent yellow bourbon beans from Brazil! This offers wonderful floral hints along with an aroma of vanilla & almond plus distinct flavors of sweet chocolate, cinnamon and even strawberry! Open personalized options below to make your selections. IMPORTANT: The more text you add the smaller the font will be on the label. We send you a proof by email before printing. You can approve or request modifications. Custom fonts available if not shown in font image link above. 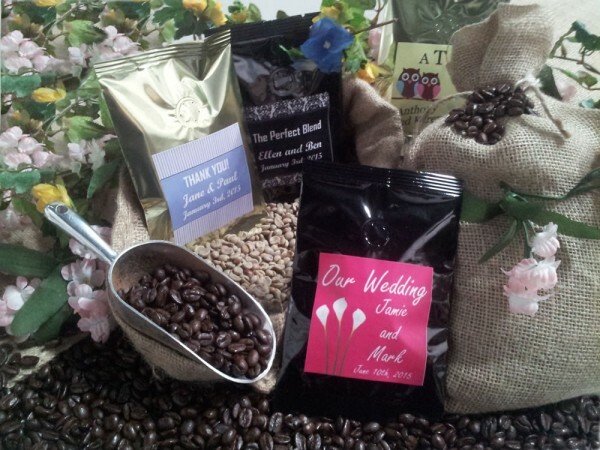 Coffee is roasted just before packaging, always super fresh, and your guests will love it!